Chain Saws Direct Announces Best PTO Chippers. Recommendations Based on Sales History and Expert Reviews. Today ChainSawsDirect.com released its recommendations for the best PTO chipper shredders. "PTO chippers are built for farms and large properties where you need to chop up big logs and branches," said Mike Sawisch, resident product expert at Chain Saws Direct. "Harnessing the power of your tractor, these units utilize the most heavy duty components to keep your property looking its best." ChainSawsDirect.com isn't your ordinary retailer. The online superstore specializes exclusively in chainsaws and wood chippers and carries more than 60 different models. 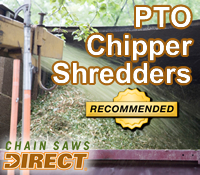 Once the dust and data settled, only 3 PTO chipper shredders sold by ChainSawsDirect.com were given its prestigious "Recommended" status. In addition, the expert staff personally wrote online reviews for each PTO chipper shredder, explaining why the company recommended it. By providing the recommendations and reviews, ChainSawsDirect.com hopes to arm shoppers with enough ammunition to pick the perfect PTO wood chipper for their needs.